The first of probably many pages about Scarlet's first birthday. She had a 'Princess High Tea' themed party with a pink and purple princess cake plus red velvet cupcakes topped with cream disguised as little cino's for all the kids to take home with them!!! It was a really great arvo and Scarlet had a great time - and even ate a WHOLE piece of her cake!!! She sure does have a sweet tooth like her mummy - and here's a sweet page to celebrate it. Notice all of the stars on the page? 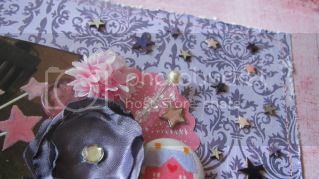 The theme this month over at Scrap The Girls is stars. When i saw this, i instantly thought i'd scrap this cake with the stars on top!!! 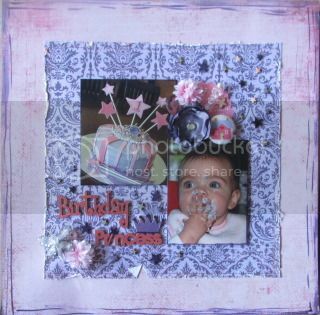 I've used a mix of wooden stars from Studio Calico and some MM brads for the stars on this page. Other embellies are from My Vintage Blossoms (next sale date is Thursday 30th August!!! ), Purple Pumpkin (next sale date is Friday 31st August! 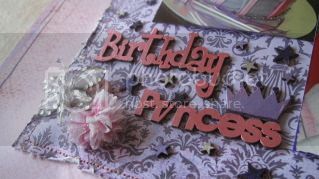 ), Websters Pages, Bo Bunny, Prima and of course that gorgeous chipboard title from WOW. The PP's are from a couple of Basic Grey ranges. gorgeous layout Kylie, and that cake looks amazing!! This is such a sweet sweet layout and I love the Princess High Tea idea! Wow, how good is that! This is a beautiful layout for a beautiful little girl. Thank you for joining us this month at Scrap The Girls. Your photo is perfect for the challenge! Love it!